Italy may lead the way with fashion, gastronomy and art, but how does it fair for spas? We sent the Spa Spies across the country to see if the Italian spa offering would be the envy of Europe. 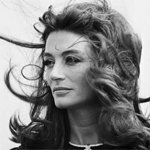 Beautiful, friendly, passionate, arty and a dab-hand in the kitchen, if Italy was a woman she would almost certainly be the envy of all her family and friends. From the tip of mountainous South Tirol to the southern shores of Sicily, Italy is home to 61 million people who can bask in the country’s snow-capped mountains, shimmering lakes, pristine beaches and historic cities. Visitors come in their droves to romance in watery Venice, visit the Vatican in Rome, splash the cash in trendy Milan, drive precariously along the Amalfi Coast, ski in The Alps, dive in Sicily, sip wine in Tuscany or hop from art gallery to art gallery in Florence. And that’s before mentioning the delectable pizza, the creamy gelato and the fine Barolo. It’s not all pizza, pasta and ice-cream (although, boy, are they good) – try the fresh seafood on the Mediterranean coast (hand-dived scallops anyone? ), the salty Proscuitto, the creamy Tiramisu or Rome’s amazing street food. While the delights of the country are as well documented as they are revered – did I mention that Italy is also home to the greatest number of UNESCO World Heritage sites? – fewer column inches are dedicated to Italy’s dense network of water channels that cause natural hot springs to pop up across the country. 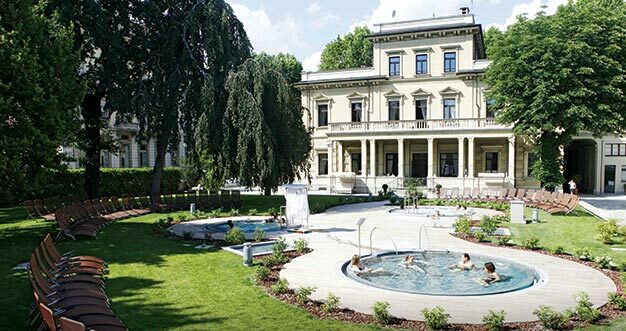 Thermal baths have been a feature of Italian town life since the Roman times, when they would bathe their troubles away in warm thermal pools, often al fresco, at weekends or after work. Fast forward to today, and spa resorts can be found in most of the areas boasting thermal activity, including regions as geographically diverse as Piedmont, Lombardy, Emillia Romagna, Tuscany and Umbria, to name but a few. 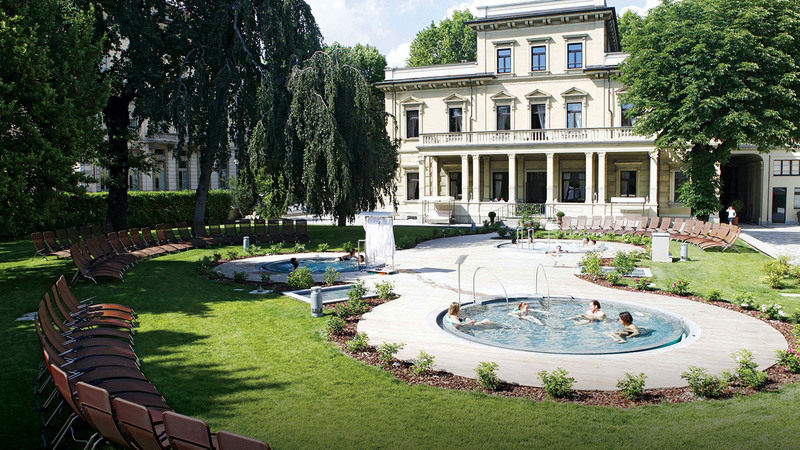 With sulphurous springs thought to combat a range of afflictions – from metabolic disorders to skin diseases – people come from near and far to combine spa-time with Italian hospitality; two million heading to Albano Terme near Venice each year for its medicinal mud, recommended for rheumatic illnesses and problems with the respiratory organs. Pleasant year-round temperatures – particularly in southernmost Sicily – coupled with short flights and relative affordability on the ground make Italy a winner for city breaks, rustic farmhouse stays, wine tours and those celebrating a special occasion. And not forgetting, of course, the spa-goer. The Alder Dolomiti is a traditional Alpine resort hotel in the pretty town of Ortisei in the Val Gardena region of the Italian Dolomites, with an added twist. 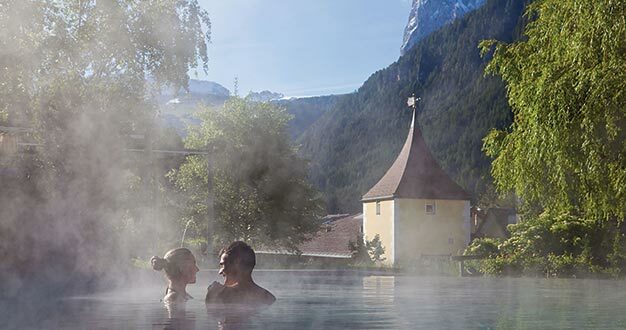 The South Tyrol’s biggest ‘wellness centre’, it comes complete with pools, panoramic thermal facilities and treatments from Avurveda to medi-spa... Continue reading. An easy drive from Verona, Lake Garda is the largest of Italy’s lakes, fringed by rugged mountains, tranquil fishing villages, and the fragrant undulations of olive groves, grapevines and citrus trees. 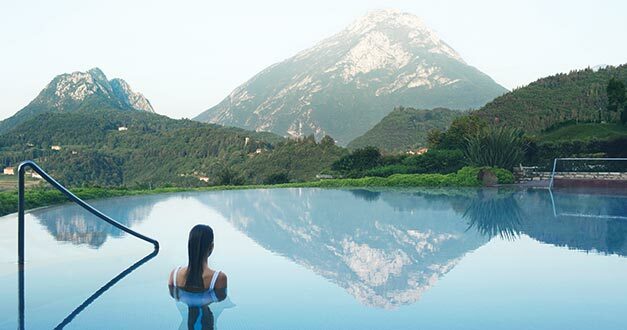 Opened in 2008, Lefay Resort and Spa was purpose-built with strong sustainability credentials (think renewable energy sources and recycled rainwater) in harmony with its natural surroundings... Continue reading. 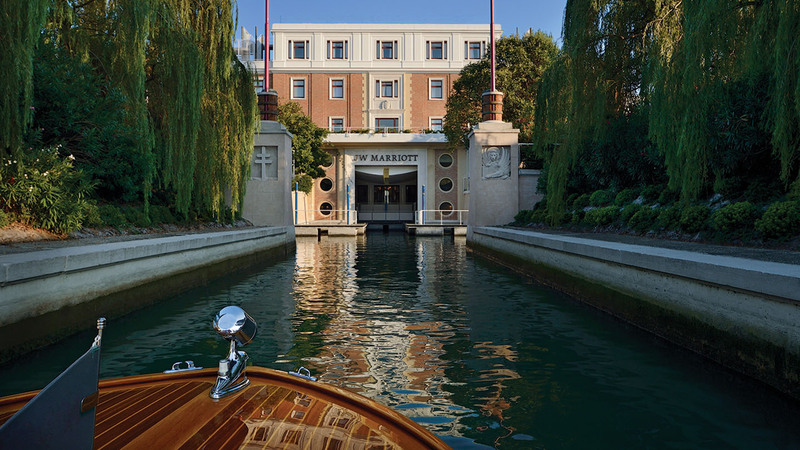 Many words have been written about Venice: the art, the music, the water, the tiny streets, the fading brickwork… It’s a romantic city-breakers’ dream, but when the noise (and the tourists) become too much, take a sleek shuttle boat to the JW Marriott at Isolde delle Rose. In the 18th Century, the island was a place of convalescence for people with pulmonary illnesses; now it’s a resort destination that’s home to Venice’s largest spa. 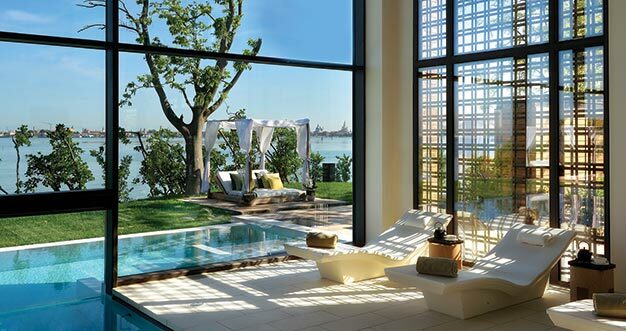 In contradiction to Venice’s lavish façade, the design of JW Marriott and Goco Spa are simple, with neutral palettes, clean lines and large windows – many with views over the Venice skyline... Continue reading. While most visitors to northern Italy beeline for Milan, only recently has neighbouring Turin gained due attention as an alluring hub of authentic Italian charm. With the majestic Alps as a backdrop, the Piedmontese capital is awash with Baroque squares, Art Deco cafes and exquisite palaces that remain from the city’s heyday as the seat of the Savoy royals and first capital of Italy. 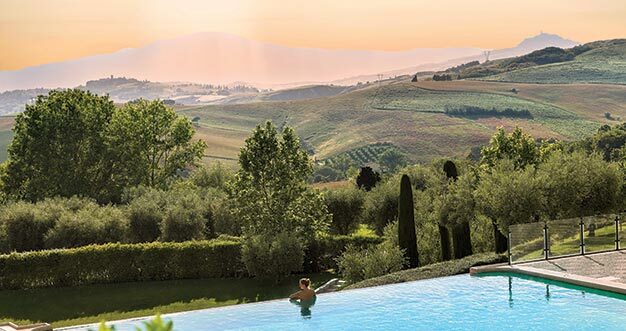 A former Medici palace set in the medieval village of San Casciano dei Bagni, Fonteverde is a grand, 17th Century property overlooking the lush Tuscan hills, and a Leading Hotel of the World. Designed to reflect the style and art of the Renaissance period – think wrought iron balconies, rich red fabrics, antique furniture and marble floors – the beautiful Fonteverde boasts 78 elegant rooms and suites, four restaurants – including one for fine dining – meeting rooms and immaculate gardens. Did I mention the views? Continue reading. Verdura is an ultra-modern resort set within 230 hectares of rugged Sicilian landscape – olive, lemon and orange groves, huge cacti, and palm trees – and facing a mile of private beach. Rooms and suites are arranged in an attractive arc making the best of the views. 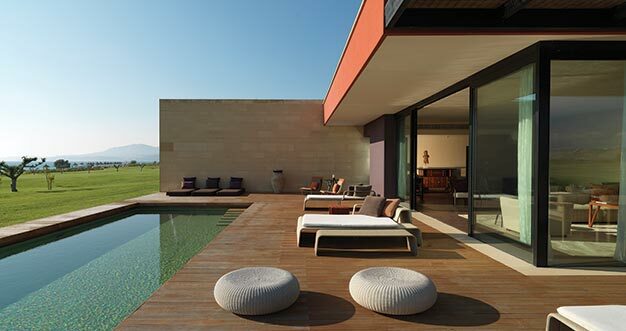 Created by Rocco Forte and his designer sister Olga Polizzi, the five-star sprawling property is the epitome of stylish Sicilian luxury, with minimalist interiors made by local craftsmen and artists. While the design is stunning – stark black and white Modernist rectangles, warmed with Sicilian ochre and terracotta – the landscape plays a major role: huge floor- to-ceiling windows are strategically placed to show off the coast and the mountains. Continue reading.